Probably one of the most bizarre stories in the Hebrew Bible is the story of Samson. The story of Samson is generally confused. The narrative is sketchy and full of riddles and often makes allusions the author seems to expect the reader to be able to connect but are meaningless to modern readers. It becomes much more clearer when viewed through the lens of ancient near-eastern mythology. Samson (שמשון) is related to ‘shamash’ (שמש) or “sun,” while his infamous wife’s name, Delilah (דלילה), is related to ‘lilah’ (לילה), the Hebrew word for “night.” He is a solar mythic hero related to Gilgamesh, the hero of the Babylonian myth, and Hercules, the Greek mythic hero. (Indeed, Gilgamesh’s patron deity is the sun-god Shamash). 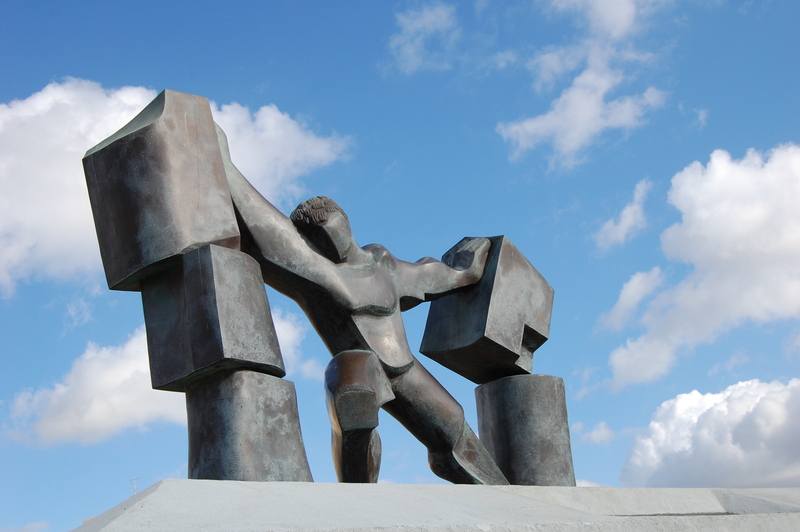 A statue of Samson in Ashdod depicting his toppling the pillars of the temple to Dagon in his dying moments. Samson’s story is found in chapters 13 through 16 of the book of Judges. Samson is a judge of Israel in the pre-monarchical period during a point in time when “Yahweh put [Israel] in the hands of the Philistines for forty years.” Judges 13:1. Chapter 13 concerns itself entirely with the birth of Samson. His father is of the tribe of Dan, and his mother is infertile. She is promised a son on the condition that Samson, once born, take the Nazirite vows. See Num. 6:1 et seq. There are only two instances in the Hebrew Bible of Nazirite vows. The second occurs later under very similar circumstances regarding the barren Hannah and her child, Samuel. See 1 Samuel 1:11. In chapter 14, Samson falls in love with a Philistine woman. On his way to visit the girl for the first time, “he came to the vineyards of Timnah, a full-grown lion came roaring at him . . . but he tore it asunder with his bare hands . . . he did not tell his father and mother what he had done.” Judges 14:5-6. A year later, he returns to marry her, and “in the lion’s skeleton he found a swarm of bees and honey.” This is interesting because honey bees will not build hives in the corpses of animals. Hercules fighting the Nemean Lion. 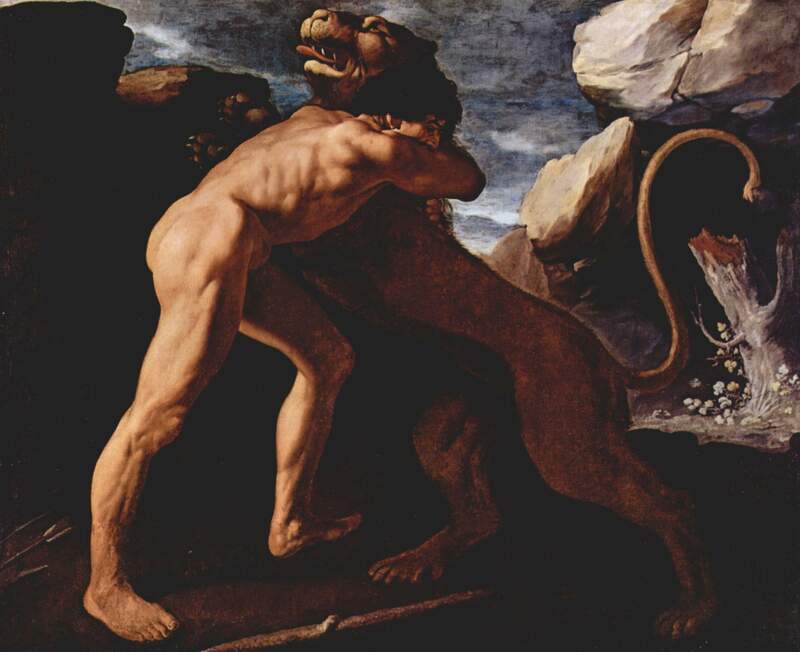 That the author bothers to describe Samson killing a lion, finding bees in its corpse, and then posing a non-sensical pseudo-riddle seems almost entirely pointless and disconnected from any other themes found in the Hebrew Bible. Most of the Biblical narrative has some connectivity until the Samson story. The whole story just does not fit well with the surrounding text. In contrast to much of Judges, there is an “almost total lack of a religious or moral tone.” J. K. West, Introduction to the Old Testament, p. 183 (MacMillan Company, New York, 1971). So what does this mean? “[T]he simple explanation of it may be nothing more nor less than that the bees produce honey in the lion, i.e., the month when the sun stands in the sign of Leo. Thus it would be quite plausible for an ancient riddle to propound the paradox, “When or where can honey be found in a lion?” And the answer, alluding to the deed of the sun-god, would be: “In the month of the . . . lion.” Paul Carus, Mythical Elements in the Samson Story, p. 44 (The Monist 1907). The “original meaning of the riddle has been obliterated in the Samson story” because of the author’s tendency to cut out mythological references. Id. 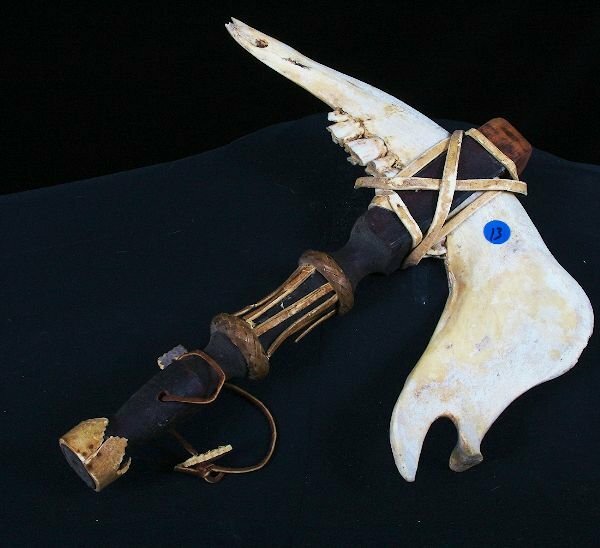 An African weapon made from a donkey’s jawbone. Samson’s slaughter is reminiscent of another judge: “Shamgar son of Anath, who slew six hundred Philistines with an ox-goad. He too was a champion of Israel.” Judges 3:31. Shamgar’s name seems related to Samson’s. Also, these ox-goads and prehistoric weapons may be related to 1 Samuel 19: “No smith was to be found in all the land of Israel, for the Philistines were afraid that the Hebrews would make swords or spears.” This is how chapter 15 ends. The narrative is haphazard and disconnected — jumping from one tale to another about the life of Samson. Chapter 16 begins with this lovely scenario: “Once Samson went to Gaza; there he met a whore and slept with her.” Judges 16:1. “The Gazites were told that Samson had come there, so they gathered and lay in ambush for him in the town gate the whole night. . . . But Samson lay in bed only til midnight. At midnight he got up, grasped the doors of the town gate together with the two gateposts, and pulled them out along with the bar. He placed them on his shoulders and carried them off to the top of the hill that is near Hebron.” Judges 16:2-3. The story never discusses this again. It’s just a description of a mythic feat. This pillar tale harkens to the ancient “notion that the sun-god enters the inhabited world in the morning through two pillars. . . .” Carus, supra, at 54. Compare this story to the Pillars of Hercules — the two mountains at the mouth of the Mediterranean Hercules supposedly set up. “To Phoenician sailors it was quite natural that the two rocks at the strait of Gibraltar should be considered as the two pillars . . . through which the sun was supposed to pass. . . .” Id. The chapter ends with Samson’s downfall. He falls in love now with Delilah (his old wife was burned to death along with her father by the Philistines). 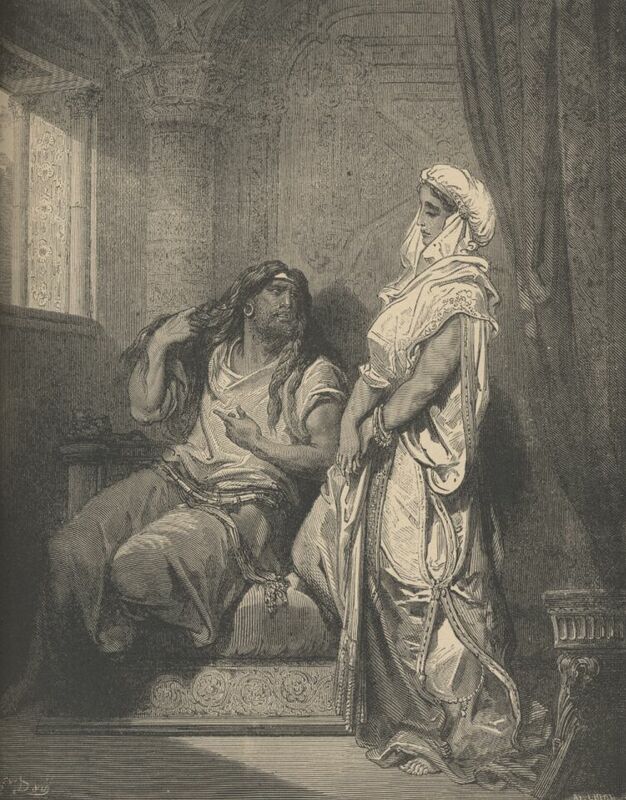 She is bribed by the Philistines to determine the source of Samson’s power (which is his unshorn hair — a sign of the Nazirite vow). She tries to find out the answer from him but he tricks her three times. He says he will become weak as a normal man if he is bound with seven fresh tendons not yet dried, new ropes never before used, or has his seven locks of his head weaved into a web. Each time she tries to weaken him while he sleeps using the method he tells her, he simply awakes and defeats the Philistines easily. Delilah attempting to conquer Samson while he sleeps is no doubt a metaphor for “Night” trying to defeat “the Sun” and is very reminiscent of the ancient Egyptian notion that each night the sun-god fought with the snake Set to bring about the new day. Each new day, after victory, the sun manages to burst forth, just like Samson is able to burst out of his bindings each morning when he wakes. Eventually he reveals his true source of power, and he is captured. “The Philistines seized him and gouged out his eyes.” Judges 16:21. This resembles the Germanic idea that there is only one sun in the sky, because Odin has only one eye. In fact, consider that the dying Samson exclaims: “Adonai Yahweh, Please remember me, and give me strength just this once, Elohim, to take revenge of the Philistines, if only for one of my two eyes.” Judges 16:28. Samson ends his life between two pillars. This is probably a motif describing the setting of the sun or its “death” as it passes between two pillars at the end of the world each night until it is reborn the next day. Four Gospels: What, Why, and When?